Filter protectors are primarily used on home heating oil tanks located outside to protect the oil filter from falling ice and snow. However, they can also be used on inside tanks to protect the oil filter from anything that could fall or knock against it causing damage and possibly a leak. The price for a filter protector varies, but is approximately $60.00. The information below should in no way be considered an endorsement of any particular filter protector manufacturer. 17" high x 12" square on top, 16 gauge, cold rolled steel is primed. This protector is the "squarest" of the 5. It sits on the ground next to the tank and covers the filter. 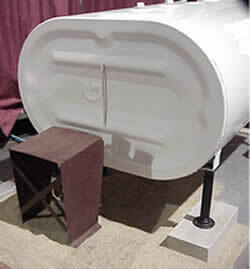 It is recognizable by the "X" shaped cross bracing on the side placed away from the tank and the fact the legs are tapered on the side facing the tank. 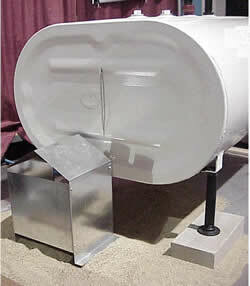 Holes in sides allow "bungee cord" to hold filter tight against tank, if so desired. 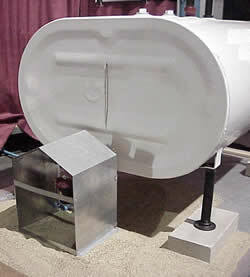 Protector for horizontal tanks is 16" high x 6" wide at the top and 12" wide at the bottom and made of 20 gauge, galvanized sheet metal. Comes with bracket that is attached to tank carrying handle and provides a lip for the filter protector to hang on. The very steep slant of the "roof" of this protector makes it excellent at shedding and deflecting snow and ice. 30" high x 9-1/2" wide at the top and 18"wide at the bottom, 20 gauge, cold rolled steel is painted black. 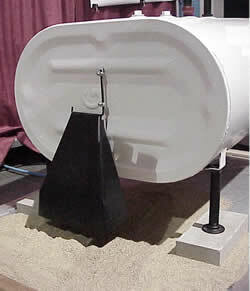 This filter protector is designed to hang on the carrying handle of a 275 or 300 gallon oil tank. The very steep slant of the "roof" of this protector makes it excellent at shedding and deflecting snow and ice. 17" high at the peak (14" high at the sides), x 14" wide x 12" deep, 16 gauge, galvanized steel. This protector looks like a house that you use when you play Monopoly®, except that the ends of the house are open. It sits on the ground next to the tank and covers the filter. It is recognizable by the two bands (1" wide) that go across the face of each end of the filter protector. (4 bands in all). Note: Some assembly required. You have to attach the 4 bands (8 sheet metal screws provided), taking care that they clear the oil filter and the copper tubing. 18.5" high at the peak (14.5" high at the sides), x 14" wide x 12" deep, 16 gauge, galvanized steel. 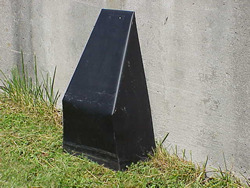 This protector is rectangular with a pitched top. It is very similar to #3 (above), but the front is partially closed off with a solid panel. It sits on the ground next to the tank and covers the filter. A visual sight hole remains at the top. 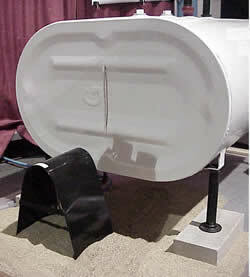 The back side has only one reinforcement strap (near the top) to allow easy removal of the filter. The filter protector comes fully assembled. 15-1/4" high x 16-1/4 wide at the base x 12-3/4 deep. 1/8 thick plate steel with Rust-Oleum enamel finish (or paint of equal durability, rust protection, and smooth finish). Filter protector makes a smooth, curved, parabolic shape that is 16-1/4 wide at its base, 11 wide at a height of 7, and has a peak at 15-1/4 high. A spacer bar on one side of the filter protector provides added stiffness. Spacer bar is 1 wide, 11 long, made of 1/8 thick plate steel, painted to match the main body of the filter protector, and is welded to the main body of the filter protector with continuous fillet welds at each end. The bottom edge of the spacer bar is at a height of 7. When used with a typical, bottom outlet (UL80) tank, the top of the oil filter will be approximately 8-1/2 above the base of the filter protector, allowing a side-to-side clearance of approximately 10-1/4. This allows ample clearance for both the filter and the copper tubing, which often makes a U-turn as it comes out of the filter. When used with a typical, older, end outlet tank, the top of the oil filter will be approximately 11-1/2 above the base of the filter protector, allowing a side-to-side clearance of approximately 7-1/2, still allowing sufficient clearance for both the filter and the copper tubing.